A new month means a new Nailbox delivery and this months box is all about the theme Summer Style. 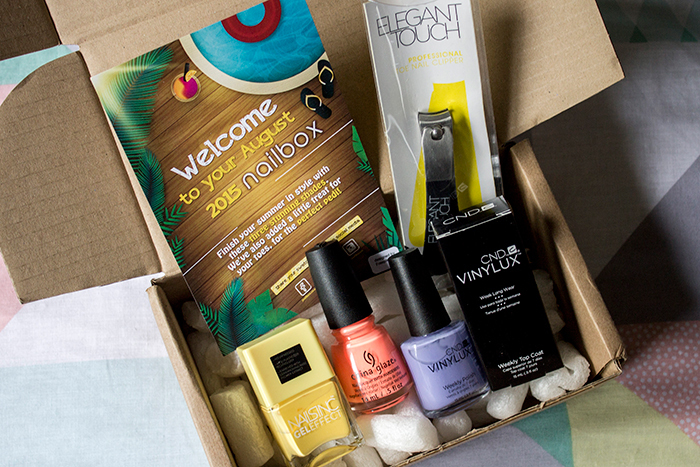 If you're new to Nailbox, it's basically a monthly subscription box filled with nail polishes and nail accessories. This is my second box after becoming a paid subscriber and it just keeps getting better and better. Here's what was in the August 2015 box. I'm a big fan of "gel effect" polishes so I was really happy to find the Nails Inc Gel Effect in Seven Dials polish included this month. Yellow is probably the colour I have least of in my extensive nail polish collection. I like that this has a sort of pastel tone running through it so I think that will make it a little more wearable. What shade could be more Summery? A shade which has been on my wishlist for quite some time and included in this months box is China Glaze Flip Flop Fantasy. I've heard so many people talk about this shade as a Summer staple so I thought that was the perfect choice to go with the theme of this months box. It's basically a coral with a hint of neon so it's the perfect holiday shade. A brand I haven't heard of was included in this months box and I'm very intrigued how it works. The CND Vinylux Weekly Polish in Wisteria Haze is a beautiful lavender shade, almost an exact colour match to those parma violet sweets. However, teamed with the CND Vinylux Weekly Top Coat this promises to last for a full week just by using natural light. I'm really intrigued to see how this lasts on the nails so I'm sure it will appear in a nail post very soon! When it's Summer, you can't forget to neglect the toes. The Elegant Touch Professional Toe Nail Clipper probably isn't the most exciting product but it's definitely handy to have, we all need one! Compared to the clipper I currently have, this one seems to be really good quality and I'm impressed that it has a 5 year guarantee. Overall I think Nailbox have done a great job sticking to the Summer theme. I think each shade has been carefully picked out for it's colour and function so I'm really excited to see what comes next. If I did have any criticisms, I maybe would have liked to have seen some different brands in the box as we've already had Elegant Touch, China Glaze and Nails Inc in previous boxes but overall I think this is the best box so far.